Enjoy a night of music and dancing on the Nile River. After pickup from your hotel, board a riverboat as belly dancers perform a pre-dinner show. Then it’s time to partake in a buffet featuring foods from around the world. After dinner, relax and enjoy the tanoura show, which features traditional folkloric dancing with weighted skirts. Take in views of the Cairo skyline as the cruise winds down. 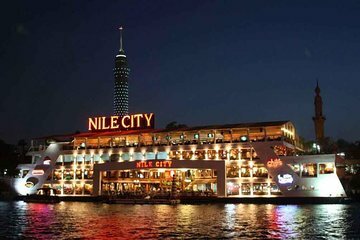 This Nile Dinner cruise is worth to join. My tour guide is MIDO. He is nice and friendly, he arrived to my hotel in time and when arrived to the terminal, he arrange everything for us however, it is a bit of waiting time there, because the dinner cruise not yet arrived. The show singing at the beginning is a bit bored, on the return journey, the belly dance and tanoura show started and make everything fun. The food has not many choice, but it was ok perhaps. I would recommended this tour.